The New York Times reported on October 11 that eating ground beef is still risky. Well, yes, but what's new about that? Of course it's still risky. Every now and then the media decide to write up something about the hazards of beef as though it were new, but the situation remains as it has been for some time. The New York Times article focused on E. coli, a short name for the bacterium Escherichia coli. We all have E. coli in our intestines; most strains of E. coli are harmless. But one strain can be deadly to humans, causing bloody diarrhea and kidney failure. That strain is E. coli 0157. It lives in the bowels of half of the beef cattle in the United States. A very small number of these bacteria can kill you - some say as few as ten bacterial cells. 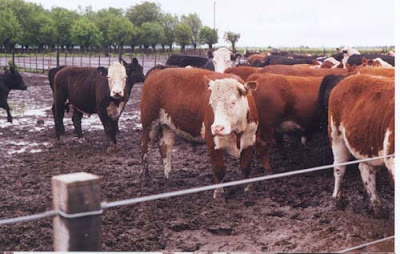 Virtually all cattle in feedlots spend their days and nights standing around in manure, and so their coats are usually contaminated with E. coli 0157. Keeping the bacteria out of their meat is a challenge. After cattle are killed in a slaughterhouse, the carcasses pass through a hot-steam area, then are sprayed with a disinfectant to get rid of E. coli 0157. In some slaughterhouses and processing plants, the carcasses are irradiated. The radiation kills bacteria, although there is some debate about effects that irradiated food may have on human consumers. In the U.S., there are occasional outbreaks of E.coli 0157 poisoning, where several people in one town will become extremely ill and a few may die. Since children eat half the hamburgers sold in the U.S., the victims are often children. The poisoning is usually traced to a single hamburger restaurant that has a batch of meat contaminated with E. coli 0157. The New York Times article featured a children's dance instructor, Stephanie Smith, who was left paralyzed at the age of 22 after ingesting a hamburger contaminated with E.coli 0157 in 2007. Before the advent of feedlots, dangerous E. coli from cattle could not survive in human digestive tracts because our stomachs were too acidic for them. But the unnatural corn diet fed to beef cattle in feedlots, to marble their flesh and increase their weight gain, increases the acidity of cattle's stomachs so that it's more similar to ours. So the cattle's E. coli 0157 have adapted to a more acidic stomach and now can survive in our stomachs too. It doesn't have to be this way. According to a study by Dr. James Russell at Cornell University, feeding cows their natural diet of hay instead of corn for only five days before slaughter will reduce the acidity in their stomachs and get rid of the acid-loving and dangerous E. coli 0157. Any remaining E. coli would not be able to survive in our acidic stomachs and so would not be dangerous to humans..
Of course, if cows were not fed corn in the first place, but were fed hay or allowed to graze, then we wouldn't have any problem at all with the dangerous E. coli 0157. So, remind me, why is it that cattle are fed corn? Oh yes, it's that familiar corporate incentive: shaving pennies from production costs to maximize profits. Because corn-fed cattle gain more weight and gain it faster, they make more money for beef producers. And we Americans have gotten used to that fat-laced meat and now prefer it. Is beef worth the risks, and the ecological down-side? You might be surprised at how fast you can get used to a life without beef. Aside from the E. coli issue, consider that a recent Worldwatch document declared beef and dairy products to be the two ecological "hot spots" in our diet - that is, the two diet items whose production does the most long-lasting damage to the planet. Anyone for a Tofurkey sausage? All plant-based and indescribably delicious. Sally Kneidel, PhD, and Sadie Kneidel. 2005. Veggie Revolution: Smart Choices for a Healthy Body and a Healthy Planet. Fulcrum Books. Michael Moss."E. coli path shows flaws in beef inspection." October 11, 2009. New York Times. What an extremely interesting blog. I just found it today and am impressed with the many issues you are advocating for and addressing. Though my blog is focused on sugar/nutrition, I am interested in many of the issues presented here in Veggie Revolution. The Marler Blog has some interesting (legal) information about beef with links to more information, and Food Politics is also addressing beef issues. I look forward to reading more of your blog. Thanks for the inspiration! This is a great post! People have no idea just how bad feed lots are for so many reasons!